A Mastermind is a group of like-minded individuals with similar goals, who meet regularly in person to support each other with the expressed purpose to promote problem-solving and creativity among a small group of business owners in a safe, supportive, constructive environment. 1. How does our group work? Typically, a group consists of 7-10 NAWBO members who meet every 4-6 weeks, develop their own agenda based on members’ needs, agree to total confidentiality and have a rotating facilitator who helps keep the group focused and on time. Sample topics for discussion may include reviewing a marketing brochure, handling a difficult customer, developing new business areas, etc. Some groups consist of non-competing members with no set agenda other than to keep each other on track. Other Mastermind groups may consist of members who want to sell on the Internet and discuss how best to do it. Or NAWBO members in the same industry may form a group to share experiences and knowledge. 2. Who can participate? 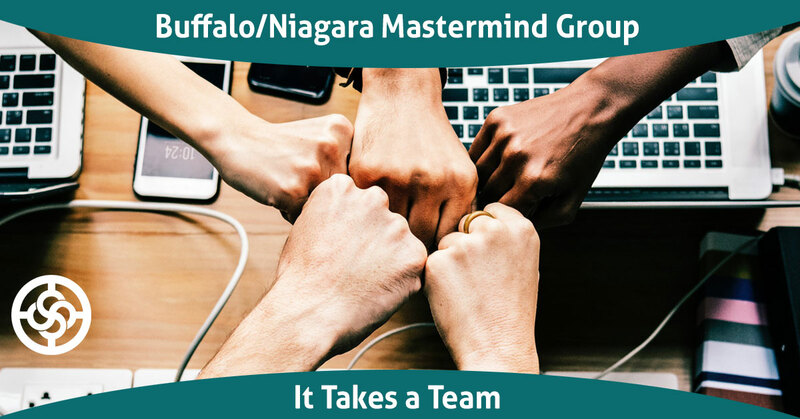 Members of Mastermind groups formed under the Buffalo/Niagara NAWBO chapter must belong to NAWBO and also be established business owners involved in management, with the power to make day-to-day business decisions. They must also be willing to sign nondisclosure agreements. 3. Meetings are confidential: Confidentiality is important to generate the full potential of the group, which encourages members to share freely, and group members will be asked to sign confidentiality agreements. 4. Non-compete clause: Individual group members will have the choice whether or not to allow a new member that may be considered in competition in a similar profession or trade so that the group can maintain success with confidence and privacy. The first member in each profession to join the group and pay dues has the right to request a competing member form a new group. 5. Let your alliance grow: Networking is important to support each other: One outstanding characteristic of our Mastermind groups are that they will automatically attract people who are in harmony with the group’s purpose. Each Mastermind group has a distinct focus, as individuals in different stages of business have different needs. 6. Placement: Please note that a group may be full, or a group may have an opening but your industry spot may be taken by someone else (a competitor). Our goal is to place you within a group if you are committed but we may need some time to do that. 7. What is the cost? The total annual fee for your annual participate is $500. You may choose to pay in full for the entire year OR you may make quarterly payments. 8. Do I have to be a member of NAWBO to be in the group? Yes, no exceptions. 9. Are there existing groups to join or just new ones? That depends on when you are reading this FAQ document. There may be existing groups to join or new ones looking for members. 10. Will I have a competitor in the group? Not unless you and the competitor agree to it. The expectation is that you will not be a group with a competitor because you need to feel comfortable speaking freely about your business. 11. What is the commitment? Masterminds meet monthly so your commitment is to attend a monthly meeting for a year. Your other commitment is to agree to lead the group as a champion at some point. Each Mastermind member serves in this function to keep the “running of the group” fair and equitable. 12. What is my role as member? The short answer is to actively participate – providing feedback, encouragement and share your business concerns. But a full description of member duties is outlined in the Member Toolkit which can be provided to you. 13. What kind of turnover is there in a group? That depends on the group. It may happen. Sometimes a person is not a good fit for a group. 14. Can I only be in one mastermind group? It is recommended that you participate in only one monthly Mastermind. 16. How long and how often are Mastermind meetings? Most Mastermind groups hold meetings once a month and are 1.5 hours. But each group dictates their own length. 17. When are the meetings? Depends on the group you join. 19. Is it just “sharing” or is there accountability? The best groups share their issues, concerns, and fears with the group but also members make commitments on what they are going to do following any discussion during the meeting. So yes, accountability is provided and is handled organically by each group. 20. What types of things are discussed at Mastermind meetings? We suggest you review the “Mastermind Agenda Guide” document to learn about the different topics, activities, and feedback mechanisms a group can deploy during its meetings. 21. Do I have to share confidential information? No. But we would ask you to seriously consider why you are joining a group that provides a safe and confidential environment and you are not willing to share the details of your business. You may not feel comfortable in the first few meetings, but you should be willing to approach the group as a place where you will share business concerns as others will share their business concerns. In addition, each member signs a confidentiality clause and if they violate it, they will be asked to leave the group. 22. What types of people are in the mastermind groups? Only the coolest! The reality is members who join Masterminds desire to grow their business, maybe in revenue or maybe to run it smarter so they can work less. They join because they want support from other women business owners, and they want to give support. Ready to jump in? DOWNLOAD THE APPLICATION.